A section of the gathering at the 2018 Republic Anniversary flag raising ceremony at D’urban Park. 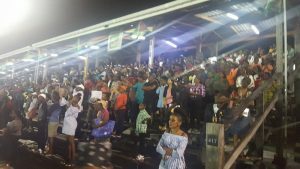 President David Granger Thursday midnight- on the eve of Guyana’s 48th Republic anniversary- ratcheted up talk of heightened border security and said he hoped international aid would be provided to the Guyana Defence Force (GDF) to execute a number of tasks including territorial protection. “Guyana looks forward to the intensification of cooperation with friendly, foreign states, especially in building capacity for the Defence Force’s technical corps to improve the national infrastructure in every part of the country, to defend our territorial integrity, to protect our citizens and to respond to emergencies,” he said in an address to the nation. An analysis conducted by the Texas-based Stratfor has examined the intent and implications of a Venezuelan invasion of Guyana. Opposition Leader Bharrat Jagdeo on Thursday called on government to disclose information about possible military action by Venezuela. The President added international cooperation is essential to preserving this continent as a zone of peace; to preventing and interdicting transnational threats such as drug-,gun- and human-trafficking, the spread of contagious diseases, terrorism and to mitigating the adverse effects of climate change and natural hazards. Granger has in recent days been on several visits to “frontline” communities near the border with Venezuela with which Guyana has a decades-long border controversy over the validity of the 1899 Arbitral Tribunal Award of the land boundary. The GDF has also moved additional troops to communities near thhe border where there have been persistent reports of heavily armed Venezuelan gangs called ‘Sindicatos’ raiding mining camps. Recalling that last month the United Nations referred the controversy to the International Court of Justice, Granger expressed confidence that Guyana would score a legal victory at the World Court. “We, Guyanese, intend to pursue our case before the ICJ in coming months with the same determination as we rejected the unwarranted claim to our territory in past years. We are confident that our cause is just and our case is sound. We are committed to defending our motherland,” the President said. Stressing that Republican status vested sovereignty in Guyanese who are charged with “assuming responsibility for defending their motherland and developing the economy,” President Granger added that the people’s efforts “have not been in vain” in clear reference to the controversy heading for a judicial settlement. Hours after Minister of State Joseph Harmon announced that Cabinet adopted President Granger’s concept note on Frontline Villages, including the provision of health, education, citizenship, security, employment, national defence, social cohesion and information communication technology, the President in his Republic Anniversary message emphasised the importance of safety. “Our citizens’ safety is the State’s paramount objective. Our people must be safe in their homes, villages and places of work. Their property, must be protected against crime,” he said. “Guyana’s Government is enhancing the delivery of services to its most distant communities, both on the coastland and in the hinterland, in good times and bad” he added. He said government was augmenting its resources to assist regional administrations and villages in times of flood, drought, threats to public order and other emergencies. Meanwhile, United States President Donald Trump, in a congratulatory message on Guyana’s Republic anniversary highlighted this country’s role in hemispheric security and promised to assist in the development of its natural resources. “The United States of America takes pride in its partnership with the Cooperative Republic of Guyana. We value your ongoing contributions to regional security and look forward to working with you on the development of your natural resources for the benefit of the Guyanese people,” Trump said. Guyana maintains that the 1899 Arbitral Tribunal Award is a full, final and perfect settlement of the land boundary with Venezuela. Next: Police Commissioner Seelall Persaud retires. Who will take over permanently?